Pontiac's new flagship sedan is the G8. Three models are now offered: a base model powered by a 261 hp V6, a V8 powered GT, and the GXP model powered by a 400-bhp V8. The G8 competes with the Chrysler 300 and Dodge Charger in the large RWD segment. 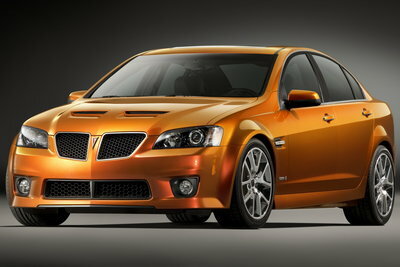 The G8 sedan gains a GXP version powered by 402-bhp (est) 6.2L V8. Both manual and automatic transmission versions are offered. The GXP package also includes unique front and rear fascias, larger brakes and tires.